We love celebrating the animals at the Aquarium—any excuse we can get. So when it's World Turtle Day, of course we're going to shine a spotlight on our big (and little) beautiful turtles! Plan a visit and come celebrate with us! Let's start with our largest turtles, the sea turtles lumbering through the 200,000-gallon Giant Ocean Tank. 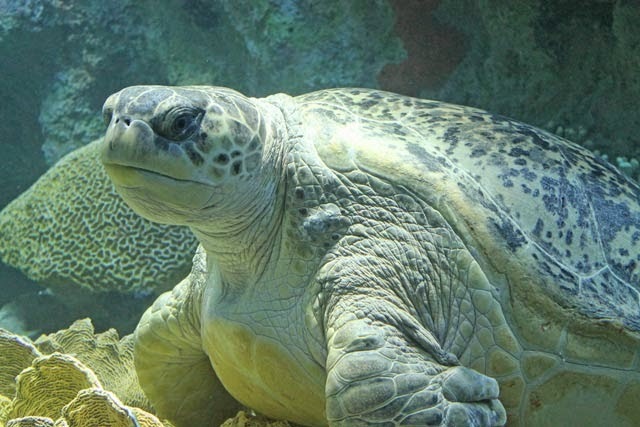 Myrtle the green sea turtle is the largest of them all, creaking the scales at more than 550 pounds. There are also two loggerhead sea turtles in the exhibit, Carolina and Retread. 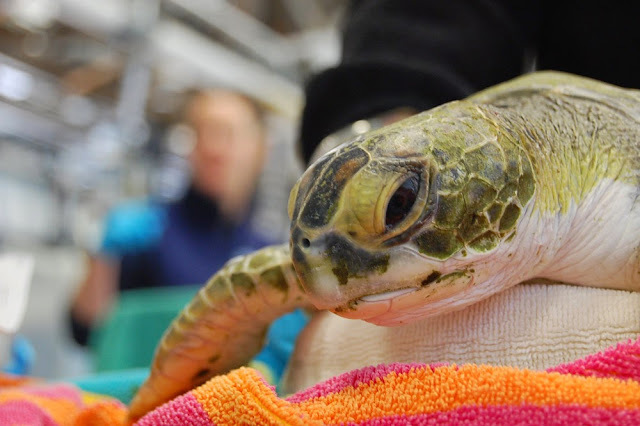 They came to the Aquarium through our Marine Animal Rescue and Rehabilitation program when it was determined that they would not be able to survive in the wild. Finally, the most petite of the sea turtles is Ari, the Kemp's ridley sea turtle, the most endangered species of sea turtle in the world. She was rescued from the Gulf of Mexico after a boat strike. 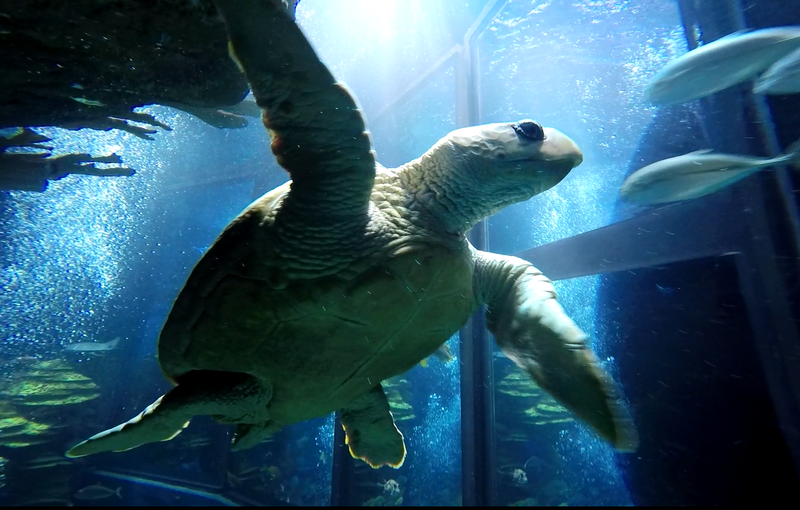 Go behind the scenes and learn more about our sea turtles and all the residents of the Giant Ocean Tank with our Meet Myrtle program! You might even get to feed the ol' lady at the top of the tank. 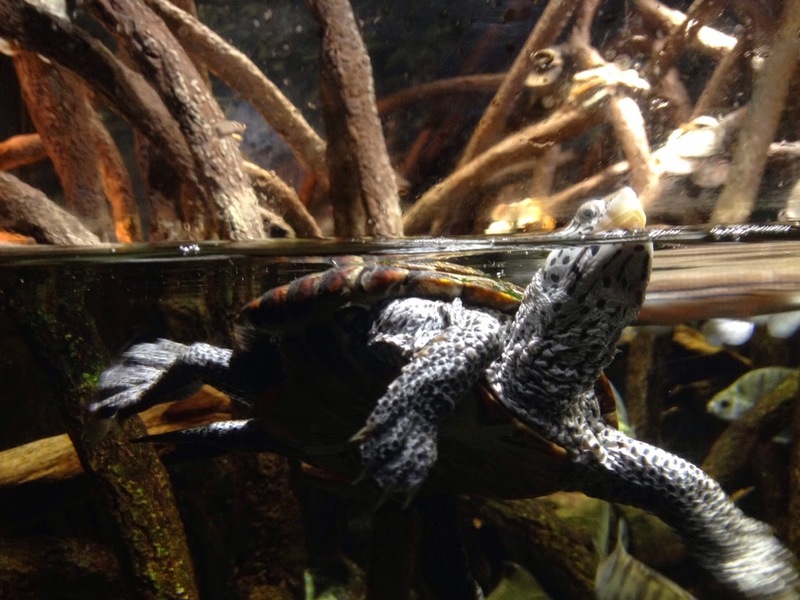 Moving over to the freshwater turtles, you'll find several in our Amazon Rainforest exhibits. 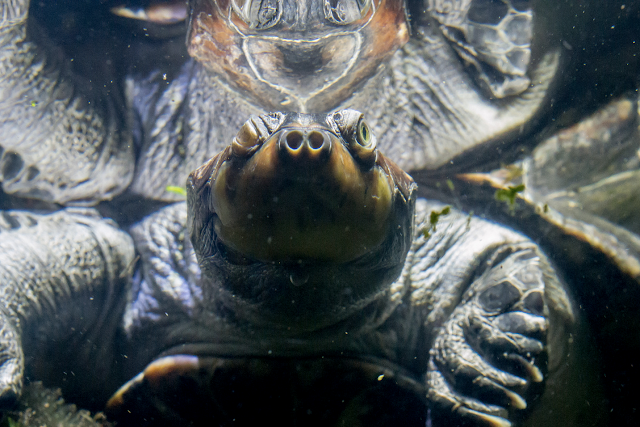 The yellow-headed and red-headed river turtles often get overlooked, what with the 13-foot anacondas and whiskered catfish drawing the eye in these dynamic exhibits. And in the brackish mangrove exhibit in the Thinking Gallery you'll find diamondback terrapins. Funny story: There's a sign on the mangrove exhibit reading "Watch for escaping turtles!" that you can see during our Behind-the-Scenes Tours. They're pretty adept climbers and they can easily crawl out of the exhibit if the lid is removed. 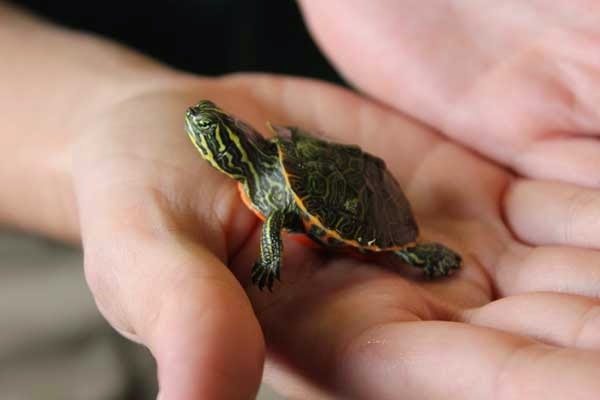 Visitors may also have an opportunity to meet a turtle during our Live Animal Presentations. Skip is a mustachioed Blandings turtle, and when he's behind the scenes he is often offered enrichment. Check out this video of Skip enjoying some peas! We also have Eastern box turtles, snapping turtles and red-bellied cooters as part of our Live Animal Presentations. 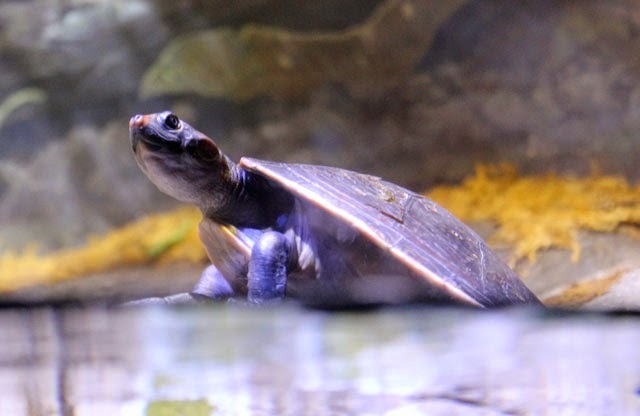 The Aquarium participates in Head Start programs for several local species of turtle, including the red-bellied cooter. These little guys spend the winter behind the scenes with us. Then when the weather turns warmer and the baby turtles have grown, we release them back into their natural habitats bigger and stronger with a greater chance for survival! And speaking of behind the scenes, you can add a Behind-the-Scenes Tour to your visit for just $20! Off in our Animal Care Center in Quincy, our rescuers care for hundreds of stranded sea turtles each fall. This year's cold-stun sea turtle stranding season was mind-blowingly busy, but most of the turtles have been released back into the wild. Learn more about our rescue program in the Blue Planet Action Center at the Aquarium. 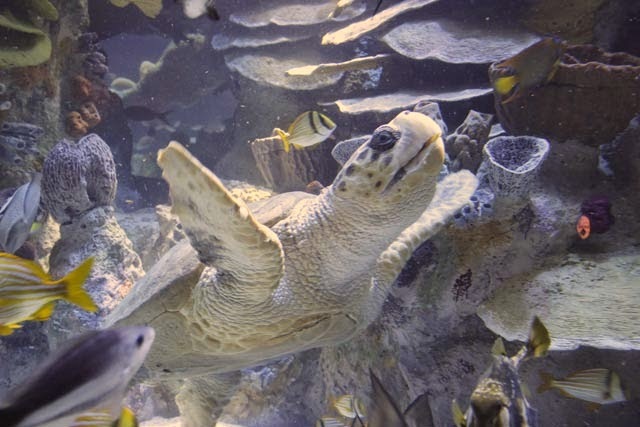 We can't think of a better spot to celebrate World Turtle Day than at the New England Aquarium, where you can see giant sea turtles, wily freshwater turtles and learn about our turtle rescue efforts. 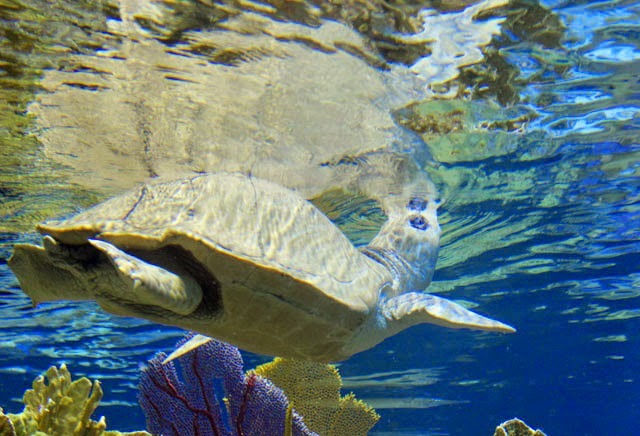 Plan a visit for World Turtle Day!